SMART Forvision EV concept is a joint venture between SMART and BASF and will be presented at the upcoming Frankfurt Auto Show 2011. The hexagonal transparent areas on the roof of the smart forvision are an eye-catching feature – as the first light-transmitting roof that also generates energy. Transparent solar cells covering the entire roof surface are the technology used here. They are based on organic dyes embedded in a sandwich roof. The transparent dyes of the solar cells are light-activated. Even in diffused light and poor light conditions they generate enough energy to power the multimedia components and the three fans that assist with climate management in the vehicle interior. If the vehicle is standing in the sun the ventilation is permanently operated with the help of these solar cells, keeping the car cool. This new photovoltaic technology opens up further efficiency potential and the energy generated can be used for further applications in the car. SMART has always been a pioneer in matters of urban mobility and with the smart fortwo electric drive the company is showing the direction of development in cities around the world.Together with BASF, the largest automotive supplier in the chemical industry, smart is demonstrating its leading role in the use of forward-looking technologies above and beyond the drive system. 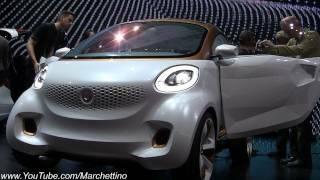 The joint concept vehicle smart forvision presented at the 2011 International Motor Show in Frankfurt combines a futuristic design with technologies relating to energy efficiency, lightweight design and temperature management. "With the forvision smart is doing justice to its role as Daimler's think tank for urban mobility. We are presenting numerous world premieres that make uncompromising electric mobility possible. With the clear objective of greatly increasing the zero-emission range we concerned ourselves with all factors that influence this on the vehicle. This resulted in completely new concepts and materials in the areas of insulation, reflection, lightweight design and energy management. In addition to transparent organic solar cells, transparent and energy-saving light-emitting diodes and infrared-reflective films and coatings, high-performance foams are used for insulation against cold and heat. smart is also setting new standards of lightweight design with the use of the first all-plastic wheels", says Dr. Annette Winkler, Head of smart. "In conjunction with smart's revolutionary DNA, we have designed a vehicle that is so unique that we can't wait to take it out of the research laboratory and onto the roads!" "Cars of the future need materials and technologies which reduce energy consumption whilst also increasing the range and level of comfort. Our innovations make a decisive contribution to this", says Dr. Christian Fischer, Head of BASF Polymer Research. "We are proud to have developed a holistic concept for sustainable urban mobility in cooperation with smart. Together we are presenting a pioneering vehicle which is without parallel. Thanks to the combination of smart's automotive expertise and BASF's material and system competence a vehicle has been created which showcases technologies for sustainable and holistic electric mobility of the future. The researchers and designers intentionally realised a mixture of visionary materials and technologies in the concept vehicle - some of these are still at a laboratory stage, while others have a realistic chance of entering series production. The hexagonal transparent areas on the roof of the smart forvision are an eye-catching feature – as the first light-transmitting roof that also generates energy. Transparent solar cells covering the entire roof surface are the technology used here. They are based on organic dyes embedded in a sandwich roof. The transparent dyes of the solar cells are light-activated. Even in diffused light and poor light conditions they generate enough energy to power the multimedia components and the three fans that assist with climate management in the vehicle interior. If the vehicle is standing in the sun the ventilation is permanently operated with the help of these solar cells, keeping the car cool. This new photovoltaic technology opens up further efficiency potential and the energy generated can be used for further applications in the car. There is an additional new feature under the solar cells: transparent OLEDs (organic light-emitting diodes) illuminate the vehicle interior when the door is opened or a button pressed. When switched off they allow for a clear view outside. This results in a glass roof effect during the daytime, whilst the areas are pleasantly illuminated without any dazzle at night. Thanks to a free choice of colours the new OLEDs do not only offer more design freedom, they also consume less than half as much energy as conventional energy-saving lamps. In the smart forvision a world first leads to a considerable weight reduction and a unique design: the first all-plastic wheel suitable for high-volume production. In its current development status, the wheel developed by BASF from a new high-performance material results in a considerable weight saving of three kilograms per wheel. Unlike conventional polyamide composite materials this new plastic has long reinforcing fibres which improve its mechanical properties. The result: excellent thermal and chemical stability, dynamic strength, toughness and good continuous operating characteristics. First intensive product tests at smart show the performance capability of the all-plastic wheel and confirm the potential for possible use in production vehicles. In addition to the tridion passenger cell, further components such as the doors are made of carbon-fiber-reinforced epoxy resin – a high-performance composite material. The use of such materials enables a weight saving of more than 50 percent to be achieved compared with steel, or 30 percent compared with aluminium. Thanks to short hardening times the resin systems from BASF are also suitable for producing larger volumes. The multifunctional, comfortable and lightweight seats in the smart forvision offer a unique combination of efficient temperature management and an energy-saving lightweight design. Here, several innovative products are combined with one another for the first time. A new, lightweight, self-supporting plastic seat shell forms the basis. Numerous studies have shown that the body only absorbs heat efficiently through certain contact points. This is why "e-textiles" – thin fabrics with custom-tailored conductive coatings – replace conventional seat heating in the smart forvision. With direct heating close to the body in the middle and lower back area of the seats they provide for a pleasant feeling of warmth. The energy, space and weight-saving e-textile technology is also found in the armrests of the doors and ensures that body contact points sensitive to the cold are also warmed in this area. The innovations continue with the seat foam, which provides for both comfort and weight savings. The material from BASF is around 10 to 20 percent lighter than other materials and enables different degrees of hardness to be realised in different areas of the upholstery in a single work operation – resulting in clear ergonomic advantages. Superabsorbent containing fleece fabric integrated in the seat greatly enhances seating comfort through its passive climate control. Compared with conventional climate-controlled seats the lightweight seat in the smart forvision does not have the complexity and energy requirement of mechanical ventilation. As a large amount of energy is needed to air condition and heat a vehicle, temperature management was a key focus area for the smart and BASF researchers. A whole package of measures has been implemented in the smart forvision to ensure more efficient air conditioning of the vehicle. At the same time they make energy-intensive heating of the whole interior superfluous. A heat shield that has not been previously used for automotive applications consists of a new kind of infrared-reflective film from BASF applied in the windscreen and side windows, protecting the car interior from heating up. Integrated between the panes of the safety glass the metal-free film ensures that the infrared rays are effectively reflected. Thanks to its high transparency in the visible range it can also be applied to tinted windows and guarantees an unprecedented level of reflection of sunlight and heat. Unlike metallized films, which are already used in some vehicles, the new film reflects only the infrared rays of the sun. Radio waves needed to use GPS, Bluetooth, mobile phones or for toll collection pass through the glass unhindered. The high-performance foams from BASF fitted in the bodypanels also provide for a pleasant climate inside the car. They keep the vehicle pleasantly cool in summer and also insulate it against the cold in winter. Thanks to their high efficiency even in a small width, they can be fitted everywhere in the vehicle. With this innovative insulation system in the smart forvision, the two companies are breaking new ground in the automotive sector. The infrared-reflective and extremely scratch-resistant coating system covers two important aspects at once. Firstly, it supports the extensive temperature management system and, secondly, the brilliant and high-quality look of the coating underlines the unique design of the smart forvision. 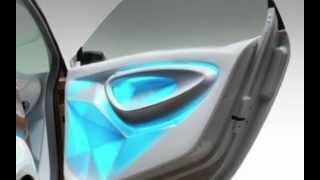 The concept vehicle features a white special-effect coating with glass flakes that create a gleaming metallic look. An important side effect: the colour white reflects heat rays from sun and light particularly well. But even surfaces coated with dark colours stay much cooler thanks to special colour pigments from BASF. They ensure that heat radiation is reflected rather than absorbed. This leads to a temperature reduction of up to 20 degrees Celsius on the paint surface and of up to approximately four degrees in the vehicle interior. 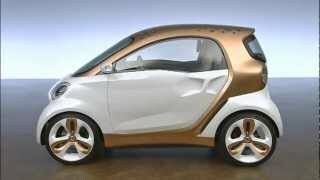 Painted in pearl white and accentuated by the tridion safety cell coated with a copper-coloured liquid metal paint, there is a deliberate connection between the basic structure of the smart forvision and the design of the smart fortwo. Trendy yet high quality – the aluminium flakes in the liquid metal paintwork create a reflecting surface on the safety cell, changing between light and dark depending on the viewer's perspective. Both the panels and the cell of the smart forvision are additionally painted with an extremely scratch-resistant clear coat. The faceted side doors with integrated door openers are a real eye-catcher. Here, plastic is presented in a new, expressive and three-dimensional form; a reinterpretation that is only possible at smart thanks to the consistent use of plastic. The precise facets give the area stability and enable a smaller material thickness to be used. Optimal use is made of the possibilities offered by plastic as a material. In contrast, the front and rear have a softer design with smooth transitions from the doors. Just as the integrated door handle does not need an additional component, the familiar smart air inlet is represented by small hexagons located right on the outer skin. The jet-like rear lights are reminiscent of small aircraft turbines and give the rear a futuristic and sporty look. Inside the lights, small propellers convey the air from the inside to the outside. In addition to all the light functions needed, transparent stacks in the form of rings around the lights also show the charge status of the battery during charging. The headlamps are emphasised by a ring comprising the daytime driving lights and indicator functions. The lights add to the likeable expression of the smart forvision. 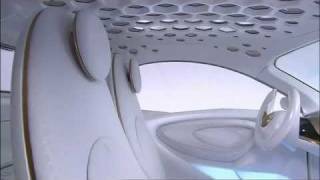 With a mix of polygonal surfaces and organic shapes the interior of the smart forvision builds a bridge to the architectural design handwriting of the exterior. This also applies to the colour concept: a cool white dominates in the interior as well, accentuated by the inner part of the instrument panel in liquid copper. Hexagons in the form of white rubber nubs on a white floor are a reference to the design idiom of the overall vehicle, as is the tone-in-tone design of the seat upholstery. The faceted surface of the side doors is also found on their inside. The polygonal surfaces with integrated armrests and stowage compartments curve into the interior. They are painted in the body colour and feature coloured LEDs. These guide the driver with a light animation running from the outside to the inside when the door is opened and closed. After closing the door the animation changes to unobtrusive ambient lighting. The elliptical user interface with a copper coloured frame – matching the lightweight tridion – is semi-transparent when switched off. When the vehicle is switched on all cockpit information is then projected onto the transparent surface. The driver uses a touchscreen to switch between operating menus. The white steering wheel that is reminiscent of an aircraft yoke additionally gives the cockpit a futuristic look. As well as function buttons the LED display for the battery charge status is found here. The smart forvision not only shows that electric mobility can make emission-free driving possible. At the same time, it paves the way for new technologies in the automotive sector. Many of these innovations are based on nano technology, the key to the development of sustainable solutions. Nano materials serve as drivers of innovation in the automotive industry, as they do in the fields of construction, energy, healthcare and electronics. The total of all technologies integrated in the concept vehicle make a perceptible contribution to increasing the range. This is always at the centre of discussions relating to battery-electric driven vehicles. With maximum energy efficiency, intelligent temperature management and consistent lightweight construction it is possible to increase the range by up to 20 percent. An additional bonus for electric mobility of the future.